Candice and David Warner have endured a rough tour to South Africa. South Africa crawled through to stumps as Australia toiled away in the field for three long sessions on day two. 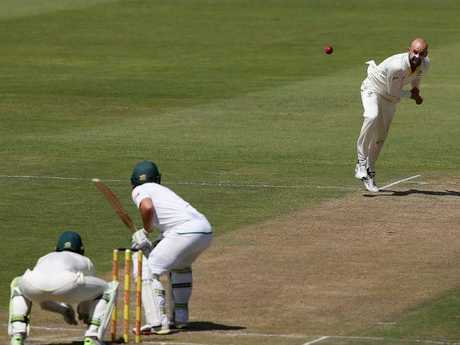 The home side lost just one wicket (nightwatchman Kagiso Rabada) in the first two sessions as Hashim Amla and Dean Elgar poked the ball around at under two runs an over before tea. Rabada's disciplinary hearing following his heated send-off to Steve Smith on day one will take place late on Sunday after the third day's play with predictions of a series ban hanging over the 22-year-old's head. Australia snagged late wickets in the evening session to have the Proteas at 7/263 and 20 runs ahead at the close of the day's play with AB de Villiers (74*) and Vernon Philander (14*) at the crease. Here were the major talking points from day two. 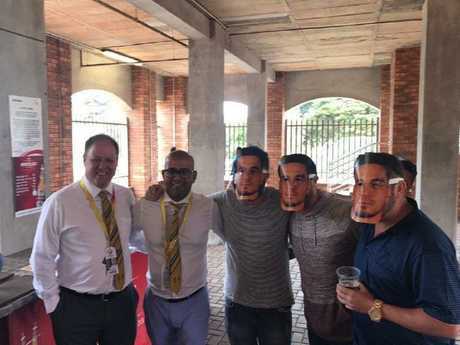 Everyone hoping for the David Warner-Quinton de Kock saga to be left in Durban woke to a rude awakening on day two of the second Test after two South African cricket officials were photographed smiling next to fans wearing Sonny Bill Williams face masks. The masks were worn to taunt Warner, whose wife Candice had a sexual encounter with the All Blacks star at a Sydney pub in 2007 before meeting the cricketer. The Australian team was reportedly furious people wearing the masks, which were promoted by users on social media, were let into the ground. The two officials, former Test star Clive Eksteen and communications manager Altaaf Kazi were scolded for their involvement in the charade which prompted a hasty apology from Cricket South Africa. The statement said CSA had taken "immediate precautionary steps" against the officials and that there would be an internal disciplinary process. The statement urged South African supporters to refrain from "being involved in distasteful or unwelcome actions that may impact the image of the sport and its supporters". However, while CSA was prepared to apologise, the organiser of the ugly stunt was not. Speaking to Channel Nine, Mark Dorward said the ploy was done not to insult Candice, but to unsettle Warner, and he won't be backing down unless the Aussie opener admits he was in the wrong for his ugly confrontation with de Kock. "It's not about her, it's about David Warner and it's about getting under his skin. We're also not using anything that's false," Dorward said. "If David Warner apologises to (Quinton) de Kock then I will organise a large apology to Candice." Warner is yet to respond directly to the ugly attack, branded "disgraceful" in some quarters, but on Sunday morning he took to Instagram to express his love for Candice and his family. The polarising Port Elizabeth band was finally given the heave-ho in the middle session after umpires called for a halt to the music. The band's cheery brass tunes go hand-in-hand with the seaside venue, often to a mixed reception from fans. The umpires had to have a chat about the band. 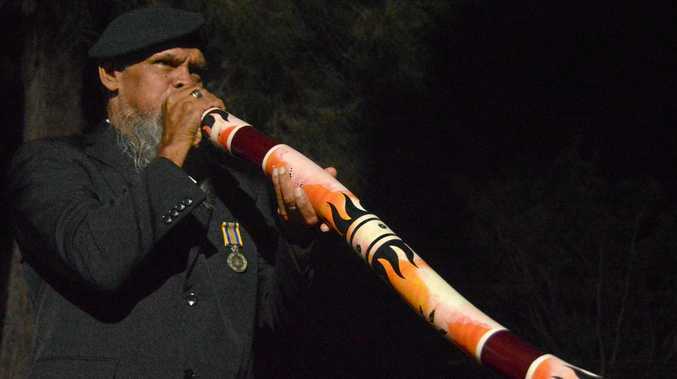 The group of musicians marched out of the venue after being ordered into silence, prompting the crowd to begin chanting "we want the band!". The band returned after the tea break and resumed playing in protest as officials complained of being unable to hear edges over the music. 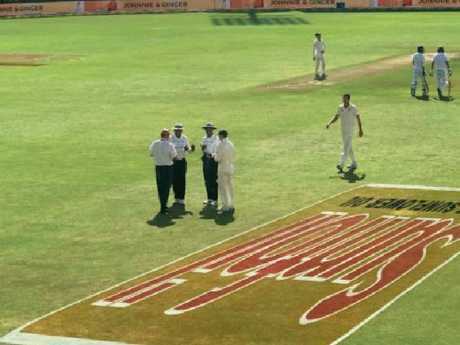 The on-field umpires met with match referee Jeff Crowe midway through the final session to briefly halt play as the music and chanting got louder and louder. Former South African wicketkeeper Mark Boucher slammed the "ridiculous" farce, comparing the noise to India's Eden Gardens stadium. Nathan Lyon produced arguably one of the best off-breaks you'll see in international cricket late on day two, dismissing South African wicketkeeper Quinton de Kock for nine as he began to build a dangerous partnership with AB de Villiers. The GOAT was producing the goods on day two. The Aussie tweaker found some purchase off the second day deck as he drew de Kock forward into a tentative prod. The perfectly-flighted delivery dropped just short of the South African star's bat and whizzed past him to collect his off stump.